A festival goer since 1997 offers all the insider tricks to get the most from your visit! * The information provided has been updated to include 2018 festival news! The Central Florida events calendar is a non-stop culinary frenzy this time of year with a plethora of food festivals, wine dinners, spirits tastings and gastronomic adventures, making the fall season the perfect time to visit Orlando. For locals, it’s a chance to give the pots and pans a break. 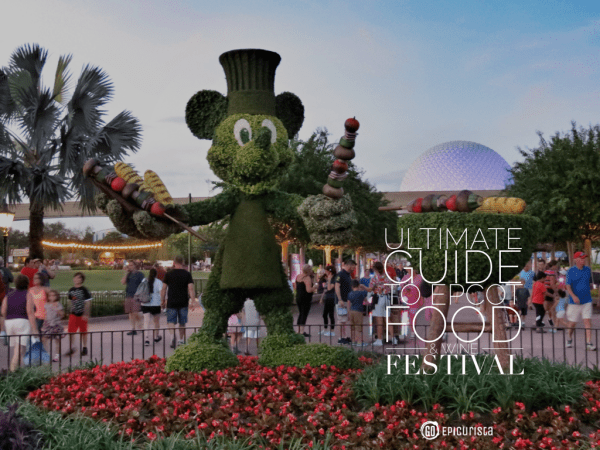 However, if you and your wallet are not so inclined to close down the kitchen completely, the “Must Do” foodie event of the fall is Epcot International Food and Wine Festival. If you’ve been, you know what an amazing overload of flavors, sights and sounds this annual event is. If you haven’t crossed it off the list, don’t wait any longer. GO #MakeSomedayHappen. 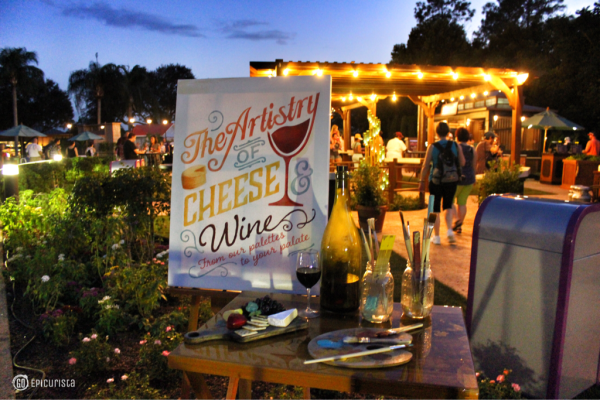 Epcot Food Festival 2015 Artistry of Cheese & Wine Pavilion offers cheeses from around the world and wines on tap! As if more than 300 dishes, wines, beers and cocktails were not enough to satisfy, you can further your culinary adventure at nearly 400 special wine tastings, culinary demos, and specialty seminars hosted by top industry experts, celebrity chefs, winemakers and sommeliers. End the day working off the calories by dancing and singing along to your favorite pop bands of yesterday and a few of today at the “Eat to the Beat” concerts. 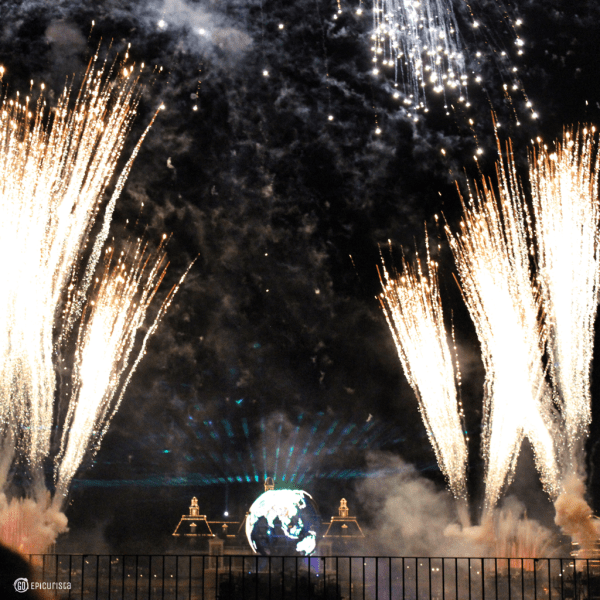 Then, simply relax and enjoy the magic of the spectacular fireworks show, IllumiNations: Reflections of Earth. With so much to do, eat and drink in so little time, it’s easy to become overwhelmed. 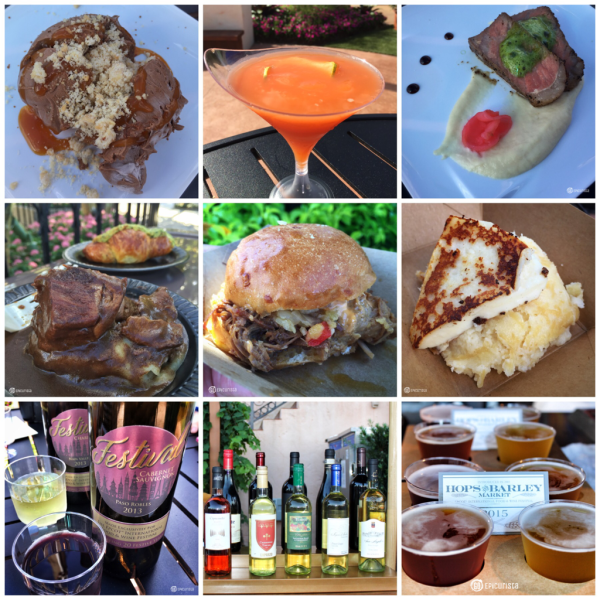 As a festival goer since 1997, I have compiled my best tips to help you enjoy the Epcot International Food and Wine Festival to the max! Rome wasn’t built in a day, and neither was Epcot, so don’t feel like you have to eat around the entire world in one day either. It’s an admirable goal, but not the wisest. Buy a multi-day pass and enjoy a leisurely stroll around the world rather than a marathon against the clock. Not only will it be a more enjoyable journey, it is also more cost-effective as multi-day passes offer better savings per day. Epcot opens at 9am and the global marketplaces open at 11am. Use this time to go on a few rides. Better yet, visit the Festival Welcome Center, located in the Future World, which opens at 9:00am. Pick up a map and plan your day while sipping a mimosa from the New Shimmering Sips bar. You’ll also find Craft Beers and Disney Family Wines and be able to pick up a bottle of Iron Horse Fairy Tale Cuvee at the wine shop, a fantastic bubbly made especially for WDW you will only find on Disney property. Review the marketplace menus in advance and select those dishes which intrigue you the most. Review the schedule for special tastings and demos, which take place at the Festival Center, and select your “Must Do” experiences. Some are complimentary and others require tickets ($17pp and up). Events featuring celebrity chefs will sell out in advance (tickets go on sale around end of July), however, while at the Festival Center, it doesn’t hurt to check for openings, last-minute additions and free book or wine bottle signings. The early bird gets the worm. 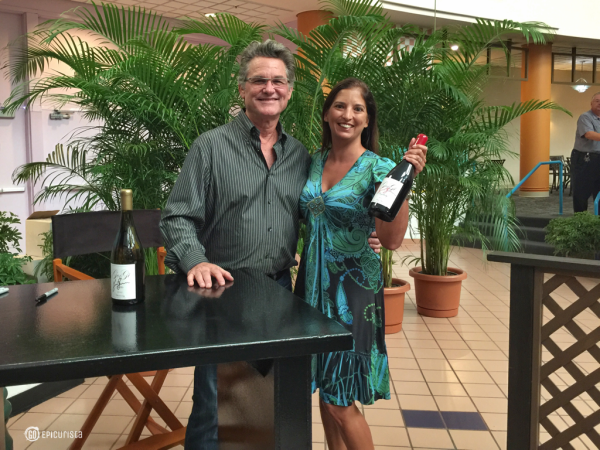 2015 last-minute add-on to the schedule, legendary movie star and now winemaker Kurt Russell introduced his GoGi Wines and signed bottles at the Festival Center. Fantastic wines and he was such a cool guy to listen to. 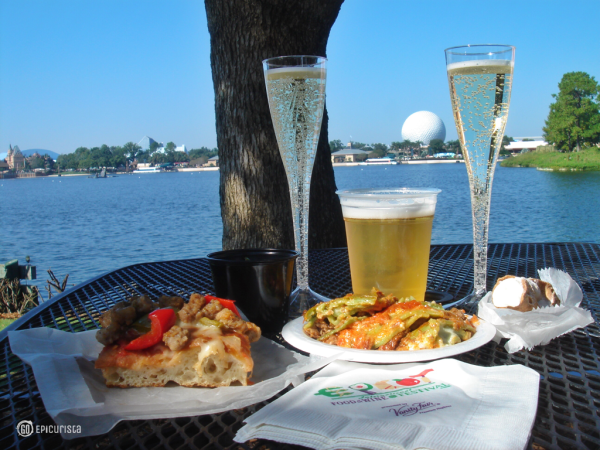 Plan your day around your “Must Eat” and “Must Do” experiences and travel around the World Showcase in order. Whether you go clockwise or counter-clock wise around the lagoon is up to you. Some say that it’s human nature to go clockwise so you can do the opposite and try to beat the crowd, if you wish. By dividing the world in half, one day go to the left towards Mexico, the other day go to the right towards Canada, and end the day in America for the nightly concerts. Whatever you do, do your best to not backtrack or you will waste precious eating and drinking time. Don’t miss the Chocolate Experience: From Bean to the Bar at the Festival Center where not only will you see incredible chocolate sculptures but also get some free samples of Ghirardelli Chocolate. Anything you get for free you must take advantage of! 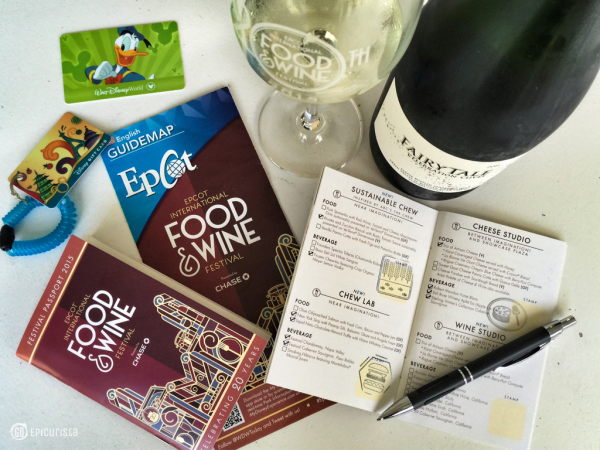 Wondering when is the best time to visit Epcot Food and Wine Festival? Weekdays are best, as weekends tend to see more locals. Crowds become heavier as the day progresses, especially after 2pm. I find it best to avoid the first week of the festival in September and prefer to visit towards the end of October and first weeks of November, when weather is cooler. Regardless of when you attend, you must expect long lines and consider it a bonus when you find a short one. Although no passport is required to travel around the world at Epcot, pick up your free Festival Passport for a fun way to prove you went, you saw, you ate and you conquered this enormous food feast. Introduced in 2010, available at the Festival Center, merchandise shops, and some of the marketplaces, it features all the marketplace menus plus a convenient festival guide. In 2016, the passport stamps were replaced with fun stickers (which are already in the book) so you can place yourself at each marketplace as you visit. Don’t forget to check off what you ordered. Your memory may get fuzzy by the end of the day after all those adult beverages. Enjoying a little bubbly from Iron Horse Vineyards Fairy Tale Cuvee and checking off my Marketplace Discovery Passport and guide is a great way to start the day. Pace yourself with the fun beverages. The tasting portions are typically 1 to 3oz. However, you may not make it around the world if you’re a fan of the full size beverages also available (16 to 22oz beers in Germany, margaritas in Mexico, slushy martinis in France, or wine in the tasting rooms of Italy and Germany), especially if you don’t like to share (see number 2 above). The beer, wine, sake and tequila tasting flights you will find on your journey are excellent values to try something new and great to share with 3-4 friends. Also, don’t forget to drink lots of water. It’s easy to forget and you will pay the price the next day. Consider yourself warned. 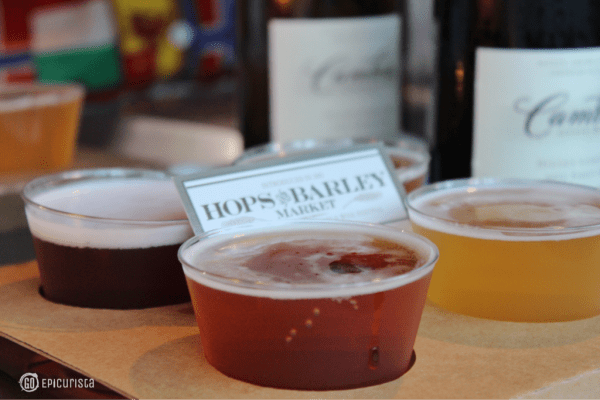 Several Beer flights are available around the World Showcase including a marketplace dedicated to Craft Beer. In 2010, Beer Flights became popular, especially for sharing, and have become a big part of the festival. As you can see, don’t be afraid to use the trash cans as your tasting table. 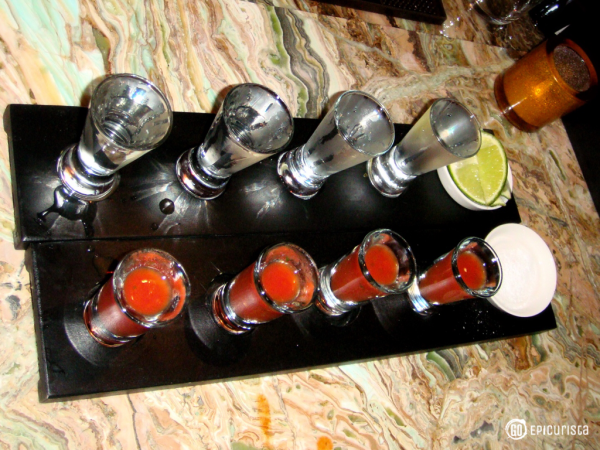 My favorite flights around the world include the tequila flight at La Cava del Tequila, a specialty restaurant inside the Mexico pavilion. It’s air-conditioned and a premium pour. The sake flight inside the Japan pavilion is a great way to explore this underappreciated spirit. The wine flight inside the Germany pavilion will allow you to taste more than Rieslings. As with any form of travel, whether in the real world or the Disney-verse, it’s important to wear the right clothing and come prepared for the elements. Comfort will guarantee enjoyment. Loose fitting clothing is the smart choice when eating copious quantities of everything from pasta to pizza, soup to noodles and desserts. I recommend no belts unless your pants are too big. Then, by all means, please belt up as it’s no longer a fashion statement. Wear layers so you can enjoy the warm days and cool nights of Central Florida this time of year. Bring a light jacket or sweater if you are prone to get cold as I am convinced Disney controls the weather inside the (imaginary) park bubble. (Pure speculation on my part) It can be unbearably hot one minute and freezing the next. Come prepared or get ready to spend a pretty penny on a sweatshirt you may never wear again. Wouldn’t you rather spend that dough on more tasty bites? 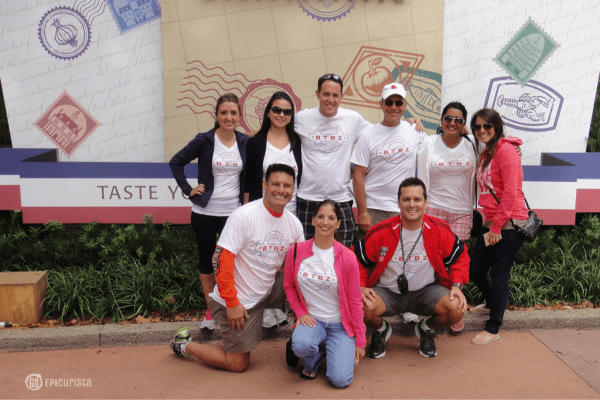 The gang dressed for the day at Epcot Food Festival. Notice comfy shoes, layers, hat, sunglasses and smiles! Bring an umbrella or poncho. Rain can come out of nowhere and your only option to stay semi-dry will be a Mickey poncho. Wear sunscreen and sunglasses. A hat is a good option too. We are in Florida. It may be snowing elsewhere, but here we are under the scorching sun. Isn’t that why you come to Florida this time of year? For air conditioned respite from the heat, take a stroll for some market shopping and a tequila flight inside the Mexico Pavilion or enjoy the show at the American Adventure building. New in 2017 is the Light Lab in the Future World. This building is kept comfortably chilled. 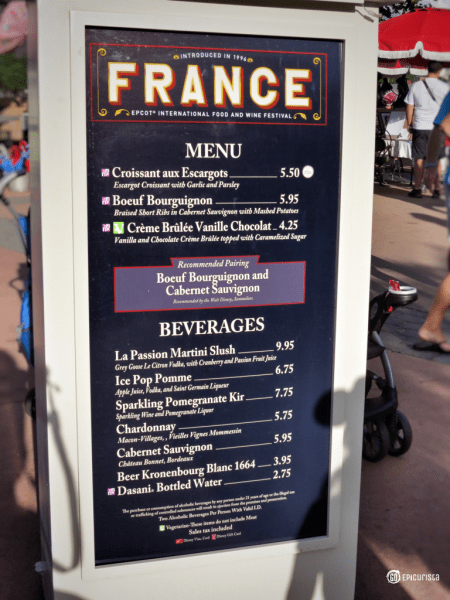 It’s easy to blow your monthly budget at Epcot International Food and Wine Festival. 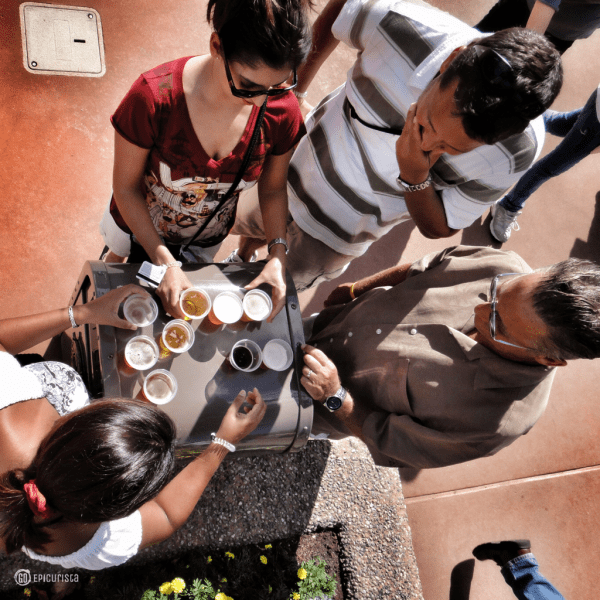 In addition to park admission, all the tasting bites and drinks, demos and premium events require an additional fee. On average, visitors will spend around $150 per person per day in tasting bites alone, not including any premium events and merchandise purchases. This can be more, or less, depending on your eating habits. The best way to plan for this and enjoy the festival is to budget a set amount per person and pre-load it to your own Disney Gift Card, available at the merchandise stores. It is also the most convenient way to pay at each kiosk as you’ll wear it as a foodie fashion statement on your wrist. The cards can be re-loaded at any cashier if you want to start with a lower amount and add later. They have a new design each year, making for a fun keepsake. Any amount not spent will remain on your card to use next visit or at select Disney destinations nationwide. In 2015, a new souvenir gift card was introduced which includes a special lanyard. Over 300 dishes and beverages are available, making it very easy to spend more than you budgeted. Use a Gift Card and choose your Must Eats! With all the eating and drinking involved you may forget there are plenty of learning opportunities. Get advance tickets for culinary demonstrations from over 190 chefs from around Disney and around the world and wine seminars where you can hone your smelling, swirling and sipping skills with sommeliers, winemakers and winery owners. Tickets for these must be purchased in advance. Call 407-939-3378 for reservations. Don’t forget to plan for travel time to the Festival Center, where these events are held. 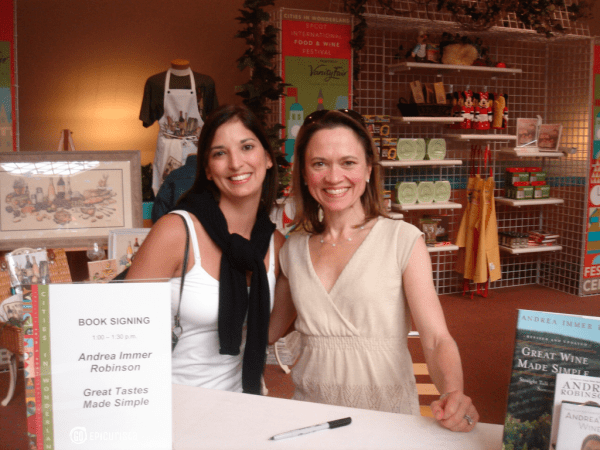 Meeting Master Sommelier & Cookbook Author Andrea Immer in 2008 was fun and educational. I still use her recipes and pairing tips today! For those who want to take their Epcot Food and Wine Festival experience to the next level, premium events give you the opportunity to rub elbows with chefs, winemakers and celebrities while tasting exclusive dishes and premium wines and cocktails prepared only for the event. The festival features over 193 premium events ranging from Signature Dinners to hands on workshops. In 2017, The “What’s Cooking With…” event series was added to the line up featuring a celebrity chef or culinary personality where you can “Eat Drink and Ask Questions”. Read all about this fun event and watch my interview with MasterChef Season 7 winner Shaun O’Neale where he dishes about his experience attending the epic festival for the first time. 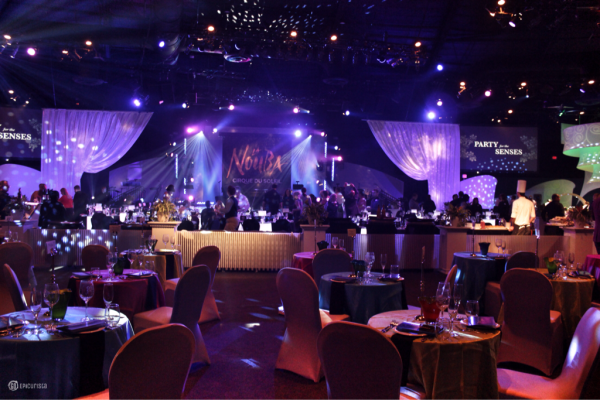 The iconic party to attend is Party for the Senses. The grand tasting event features over 50 stations of amazing dishes and beverages and world-class entertainment. Held on select weekend days, it comes at a premium price but it truly is a spectacular event and includes special seating for the Eat to the Beat Concert and viewing area for the fireworks show. You can read all about my experience at this magical Party for the Senses event with a Halloween theme. Disney character sightings and street performers will keep you entertained during the day. Kids and kids at heart can join the other famous mouse, Remy from Ratatouille, in his Hide & Squeak Scavenger Hunt. New collectible pins are available. 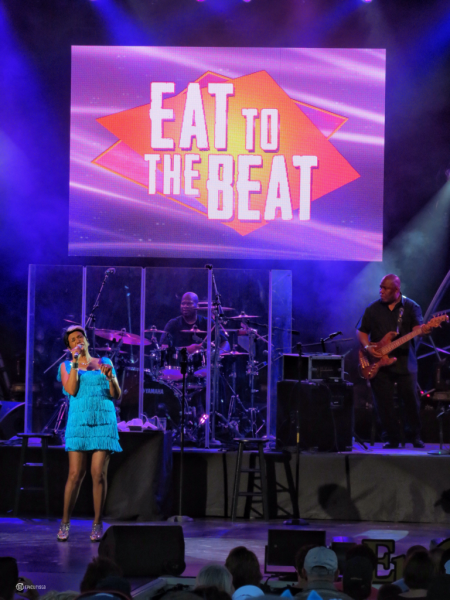 In the evening, blast to the past with musical guests guaranteed to bring back memories of crazy fashions and crazier hairstyles at the “Eat To The Beat” nightly concerts in the America Garden Theater. Get in line early and trade turns with friends as you bring back food and drinks from the surrounding kiosks or you can wait until 10 minutes before the show for any leftover seats. Popular bands perform three 30 minute shows nightly, with the last show of the night being the most popular as the stage lights shine bright. If it’s your favorite band, watch more than one show as some will play different sets, however note you will have to leave the theater after each show. After the last show, find a spot around the lagoon to catch the spectacular fireworks show. Keep in mind if you are under the lush trees, your view may be blocked. If you would like to sit and dine while watching the fireworks, make reservations at La Hacienda San Angel in Mexico or Rose & Crown Pub’s outdoor patio in UK. The best part, all of this entertainment is included in your park admission. Make your journey around the world at Epcot International Food and Wine Festival a true getaway – whether you’re local or an out-of-town visitor – and plan to spend the night at one of the gorgeous area resorts. The Walt Disney World Swan & Dolphin Resorts, Disney’s Yacht & Beach Club Resorts and Disney’s Boardwalk Hotel are all within walking proximity located around the Disney Boardwalk, which also enjoys a special entrance to Epcot that places you between UK and France and much closer to all the food action. For the ultimate luxury, Walt Disney World Resort visitors have fantastic options within a short Disney shuttle ride. 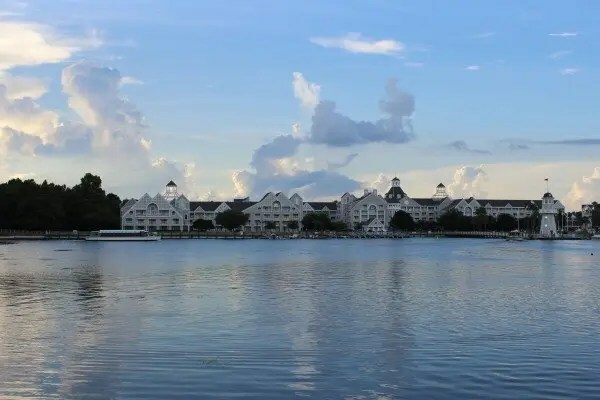 The Four Seasons Resort located on Disney’s Golden Oak property, is spectacular and the only five diamond resort in town. The resort’s Ravello and Capa restaurants are on my Must Eat List of Orlando. The luxe Bonnet Creek Resort includes legendary Waldorf Astoria Orlando and Hilton Bonnet Creek which host special events as part of their Food and Wine Weekends throughout the dates of the festival. Don’t miss exclusive dining experiences at famed Bull & Bear, La Luce and Zeta restaurants, their decadent Bar Du Chocolat and the always fun Cocktail Creations. Wyndham Grand Orlando Resort Bonnet Creek offers a boutique experience with fantastic Bar 1521 and deep blu seafood grill, perfect for a foodie staycation. Plenty of choices in a wide budget range are available and definitely worth it so you can fully enjoy yourself without the worry of driving afterwards. You may consider reserving a suite to share with friends for the ultimate experience. 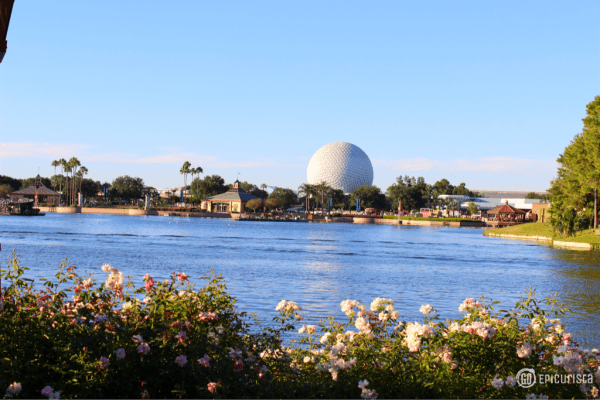 Epcot Yacht and Beach Club Resorts, Swan & Dolphin and Boardwalk Resorts at the Disney Boardwalk are perfect for a getaway! 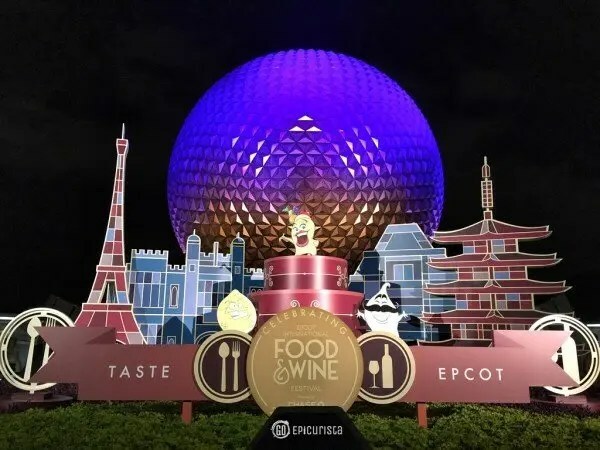 With over 400 food and wine options to choose from, the Epcot International Food and Wine Festival is the perfect place to explore international cuisine. Go ahead, be adventurous, try something new. How about trying escargot in France or moqueca in Brazil? After all, the food is being prepared by the world-class Disney chefs, so unlike some dishes you may try on the streets around the real world, here at Disney you don’t have to wonder if it’s mystery meat you’re eating. The only thing you have to worry about is whether your taste buds will enjoy it or not. You may find a new favorite and if not, then consider the $3-$8 spent as an investment in your gastronomic education. 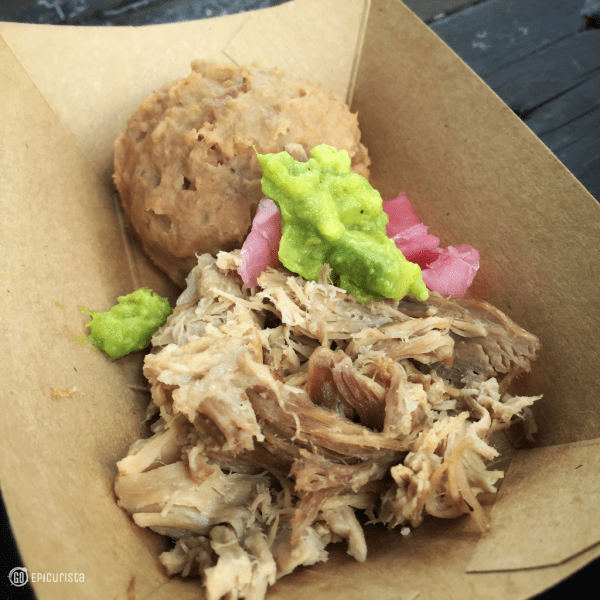 In 2015, Dominican Republic marketplace features Lechon Asado: Roasted Pork with Mangu, mashed plantains, pickled red onions and avocado. If you’re not sure what to order, the featured food and beverage pairing selection listed on the menu board at each marketplace is a great place to start. The mix of marketplaces changes each year and you will find new dishes together with all-time favorites. Be sure to try a mix of both. The menu board in France is full of awesome choices! Try the pairing and you won’t be disappointed. I had the opportunity to attend a taping of ABC’s The Chew, which filmed on location for the first time during the Epcot Food and Wine Festival in 2015. Check out all the behind the scenes shenanigans as well as some favorite dishes and more from celebrity chefs Mario Batali, Michael Symon, Carla Hall and Clinton Kelly in this post here. Unfortunately the show was cancelled in 2018, however you can still see Carla Hall at her culinary event. She’s the biggest Disney enthusiast. 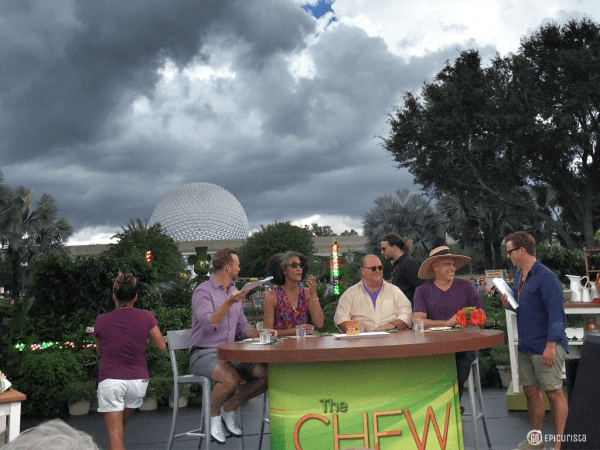 ABC’s The Chew filmed on location at Epcot Food and Wine Festival for the 1st time in 2015. The number of Disney fans who make a routine pilgrimage each year to the church of Food & Wine at Epcot is in the millions. My foodie friends, if you are one of them, I would love to hear your tips for getting the most out of this world-class event. What tip would you make #10 on the list? Please share in the comments below. Follow #TasteEpcot on social media to see what everyone is enjoying. I hope you GO enjoy and take part in one of the best and most extensive food festivals in the world.